12. Welfare theory and valuation (N. Bockstael, A. Myrick Freeman, III). 13. Environment, uncertainty, and option values (A. Fisher, K-G. Mäler). 14. Valuing the environment as a factor of production (N. Bockstael, K.E. McConnell). 15. Recreation demand models (V.K. Smith, D. Phaneuf). 16. Property value models (R. Palmquist). 17. Contingent valuation (R. Carson, M. Hanemann). 18. Cognitive processes in stated preference methods (B. Fischhoff). 19. Experimental methods and valuation (J. Shogren). 20. Quantifying and valuing environmental health risks (W.K. Viscusi, T. Gayer). Much applied environmental economics is concerned with the valuation of changes in environmental quality. Obtaining reliable valuation estimates requires attention to theoretical and econometric issues that are often quite subtle. 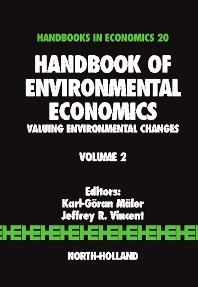 Volume 2 of the Handbook of Environmental Economics presents both the theory and the practice of environmental valuation. It synthesizes the vast literature that has accumulated since the publication of the Handbook of Natural Resource and Energy Economics two decades ago. It includes chapters on individual valuation methods written by researchers responsible for fundamental advances in those methods. It also includes cross-cutting chapters that deal with aspects of welfare theory, uncertainty, experimental methods, and public health that are pertinent to valuation. Throughout the volume, attention is paid to research and policy issues that arise not only in high-income countries, where most of the theory and econometrics that underlie applied valuation methods have been developed, but also in poorer parts of the world. The volume provides a state-of-the-art reference for scholars and practitioners alike.